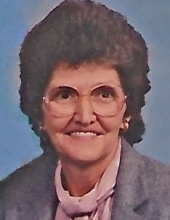 Mrs. Betty Jean Fields of Greensburg, Kentucky, daughter of the late Robert Acie Brady and Carrie Ella Chisolm Brady, was born on Tuesday, December 12, 1933 in Selma, Alabama and departed this life on Sunday, January 27, 2019 at the Taylor Regional Hospital. She was 85 years, one month, and 15 days of age. She had made a profession of faith in Christ, attended Pleasant Valley Baptist Church, and was a former bookkeeper. She united in marriage to Billie Gene Fields on March 24, 1956 who preceded her in death on March 3, 2010. Survivors include two sons: Barry Fields of Bowling Green, and Mark Fields of Alabama; seven grandchildren: Mia Fields, Maison Fields, Zach Fields, Olivia Fields, Rachel Fields, Isaac Fields, and Luke Fields; one great-grandchild: Conner; a sister: Nancy Cooper of Alabama; and a host of other relatives and friends. Mrs. Fields was also preceded in death by two sons: Eddie Fields and William Todd Fields. There will be graveside services for Mrs. Betty Jean Fields held at 12:00 Noon, Central Time, Wednesday, January 30, 2019 at the Pleasant Valley Cemetery. Bro. Roger Pepper officiating. Visitation is requested from 4 P.M. until 8 P.M., Central Time, Tuesday at the Cowherd and Parrott Funeral Home and from 7 A.M. until 11 A.M., Wednesday. Memorials are suggested to the American Cancer Society, which can be made at the Cowherd and Parrott Funeral Home. For online condolences log onto: www.cowherdandparrott.com. To plant a tree in memory of Betty Jean Fields, please visit our Tribute Store. "Email Address" would like to share the life celebration of Betty Jean Fields. Click on the "link" to go to share a favorite memory or leave a condolence message for the family.